Canadian physician, soldier, teacher and poet John McCrae was born in Guelph Ontario on November 30, 1872, the second son of Scottish immigrants Lieutenant Colonel David McCrae and Janet Simpson Eckford McCrae. John McCrae had a remarkable affinity for people and animals. His many friends and colleagues described him as warm and compassionate with very high principles. After graduating with honors from Medical School in Toronto in 1898, John McCrae served in the artillery during the second Boer War in South Africa (1899 – 1901). McCrae was shocked by the poor treatment of the sick and injured soldiers. Upon his return McCrae completed his studies in Pathology at McGill University in Montreal. He then became an associate of medicine at Royal Victoria Hospital in 1904 while serving as Resident House Officer at Toronto General Hospital. He went on build a busy private practice, taught at McGill University and was appointed professor of pathology at the University of Vermont, a position he held until 1911. As an author, John McCrae wrote numerous articles for medical journals, co-authored “A Text-Book of Pathology for Students of Medicine” with J.G. Adami and published a number of poems, letters, articles and short stories in national magazines including Saturday Night and Godey’s plus the University of Toronto student newspaper, the Varsity. John McCrae was also a contributing writer to Osler’s Book of Modern Medicine, a 10-volume textbook by William Osler. In the summer of 1910 John McCrae accompanied Governor General Earl Grey as expedition doctor on a month-long canoe trip from Lake Winnipeg to Hudson’s Bay. In 1914 at the start of the First World War, McCrae followed his sense of duty to God, his country and his fellow man and enlisted. In a letter to his mother John McCrae wrote, “I am really rather afraid, but more afraid to stay at home with my conscience.” At 42 years of age, McCrae was older than most WWI volunteers when he enlisted. In 1915 he was given the rank of Major and appointed brigade-surgeon to the First Brigade of the Canadian Forces Artillery stationed at Ypres, Belgium. When McCrae went to Europe he took with him his horse Bonfire, a gift given to him by his friend John L. Todd. McCrae was very fond of animals and often wrote home to his niece and nephew as if the letters were from Bonfire and signed with Bonfire’s hoof print. 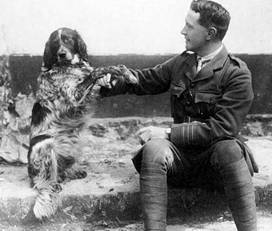 While at Ypres, John McCrae also befriended a dog he named Bonneau which accompanied McCrae on his rounds through the medical wards. The second major battle at Ypres, Belgium began on April 22, 1915. The Germans used poisonous Chlorine gas in the attacks and during “17 days of Hades” as McCrae described it, he and his medical staff treated nearly 4600 wounded men. While still at the battlefront during the second battle of Ypres, John McCrae performed a burial service for his good friend and former student Alexis Helmer. 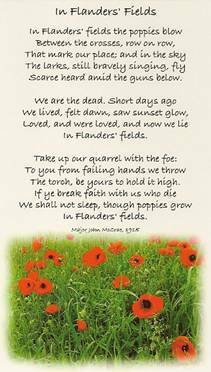 The next day on May 3, 1915 McCrae reportedly sat on the step of an ambulance wagon and composed what is now considered to be the world’s most famous and recognized war memorial poem, IN FLANDERS FIELDS. John McCrae’s Flanders Fields poem was first published anonymously in the December 8th 1915 issue of the British PUNCH magazine and is credited with the inspiration for adopting the “poppy” as Canada’s official Flower of Remembrance, which is also recognized in Canada, the U.S., France, Britain and other Commonwealth countries including Australia and New Zealand. Shortly after its publication, McCrae’s In Flanders Fields poem became the most popular English poem of the First World War. It was translated into many languages and used in countless fund-raising campaigns for the war effort. Each year the poem is recited at Remembrance Day ceremonies and memorial services around the world. On April 17th, 1915 John McCrae earned the rank of Lieutenant Colonel. On June 1st, 1915 McCrae left the battlefront and transferred to Number 3 General Hospital at Boulogne where he treated wounded soldiers from the battles of Somme, Vimy Ridge, Arras, and Passchendaele. On January 5, 1918 McCrae became the first Canadian ever to be appointed as Consultant Physician to the British Armies in the Field. Unfortunately, McCrae died before he could he could take up his new position. McCrae suffered from asthma since childhood and by December of 1917 his health had dramatically declined. John McCrae succumbed to pneumonia and meningitis on January 28th, 1918 at Number 14 British General Hospital for Officers in Boulogne, France. His funeral procession was led by his horse Bonfire and in the tradition of mounted officers; McCrae’s boots were placed backwards in the stirrups. 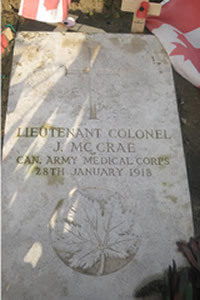 Lieutenant Colonel John McCrae MD was buried with full military honors in the cemetery in Wimereux, France (plot 4, row H, grave 3). John McCrae’s funeral was one of the best attended funerals of the entire war. In attendance were his many friends, military dignitaries, nursing sisters and colleagues. 2008 marked the 40 anniversary of opening of McCrae House in Guelph Ontario, the stone cottage birthplace of John McCrae. Built in 1857 McCrae House remained a private residence for over a century until it was threatened with demolition in the mid-1960’s. Local residents (including Cyril Allinson, the young soldier who witnessed John McCrae writing the poem in 1915) formed the John McCrae Birthplace Society, purchased the home and opened John McCrae House as a museum in 1968. McCrae House also includes John McCrae’s war medals plus a Garden of Remembrance with a memorial cenotaph. Visit John McCrae Timeline, a chronology page with more John McCrae facts and information.